When my husband was still alive we lived in our own home in Langley. 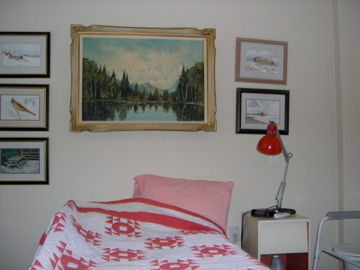 He loved to read in bed, something that I couldn’t do….so we settled for each having our own room. you touched it once to go brighter, twice to go brighter still, and three times to turn it off. After he died, the lamp would go on when no one was around…and I would find it like that when I went down the hall past his room. I finally took the lamp for beside my bed, and it would turn itself on every now and then. My computer was on the opposite wall….with watercolour paintings framed in glass above it. One day I was working on the computer, editing Ra’s book. All of a sudden lights started flashing that I could see in the glass on the paintings. It was coming from the lamp,….going through all the stages, even to ‘off’, then starting over. I went to check what was wrong with the lamp, and found nothing…. so went back to editing. The very next thing that it said in the book was…”It’s my birthday today”…. and I was, and still am, positive it was my husband letting me know he KNEW what was going on in our lives. Now that Danny has joined his dad, I feel that it must be a joint effort. Having a Grandson who has informed me of visits from loved ones passed I am a firm believer. When he was about a year old he would blow kisses to a picture I have of Mom. She passed away before he was born. When he was around the age of 4 I had brought out a picture of Gails daughter Tanya that I had found and put it on my book case. When he saw it his face lit up and he said ” I know her . She comes and sees me sometimes ” Pete asked him what her name was and he said he thought it was Tanners. Well I always called her Tanners. So do I believe , you bet I do !